Construction work on a segment of rail track extending from Iran to Afghanistan’s western Herat province is due to be in service any day it seems. The Iranian Ambassador to Afghanistan made the announcement recently. Mohammad Raza Bahrami, Iran’s ambassador in Kabul, visited the province and oversaw ongoing work on the Herat-Khawaf rail track. This railway route development is great news for both Afghanistani and Iranian companies seeking to expand imports and exports as far as China and India. Afghanistan is seen as a key strategic partner in the region by Tehran, with the government here investing a $75 million grant into the project to aid cross border trade. The 191km Herat-Khawaf railroad construction has been planned in four sections, three being financed by Iran and one funded by Afghanistan. The network has been ten years in development, with work beginning on this 62km rail freight route from Iran’s border to the Ghoriyan District of Herat in 2007. Of the 62km’s of the rail transport corridor in Afghanistan, completion is running apace to complete by the 26th October. China plans to send six more cargo trains to Iran via the Kazakhstan and Turkmenistan rail freight route within the next couple of months. The Director of Transportation Department at the Islamic Republic of Iran Railways, (IRIR), Ebrahim Mohammadi announced these latest international transport and logistics developments while marking the ceremonial arrival of a freight train from China to Iran via Incheh Borun in northeastern Golestan Province, bordering Turkmenistan. Mehr News Agency quoted Mohammadi as saying “The preliminary agreement was reached in a meeting with Liang Hua whose company is in charge of the operation. The [visiting] Chinese delegation also welcomed the idea of creating a terminal near Tehran train station”. "The train takes more than 20 days less than transporting by ship, and is expected to greatly lower our delivery costs." 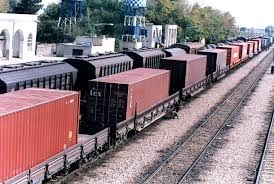 These more affordable railway cargo rates are good news for Iranian importers seeking to meet increasing demand in Iran. This is the second Chinese freight train to Tehran, the first being in January, taking 14 days to come from Yiwu City in China’s Zhejiang Province. This first bulk train covered 10,399 km, passing through Kazakhstan and Turkmenistan, to reach Iran’s border station of Sarakhs in the Khorasan Razavi Province. This New Silk Road rail freight route was first proposed by He Huawu, China’s Railway Corporation Chief Engineer only in late 2015, demonstrating the Chinese commitment to trade expansion in the region. From Tehran, China’s Silk Road project will join Iran’s East-West network leading to Turkey and eastern Europe. There are also further European freight transport options via a rail route in development from southern Iranian ports to Azerbaijan and Europe. The Belt and Road initiative proposed by China’s President Xi Jinping, includes several land and sea transport corridors, including New Silk Road railway which should see increased trade with Iran and China. China is supporting Iran’s upgrading of rail networks via this project. China signed a contract in July in Tehran committing to financing electrification of a 926km section from Tehran to Mashhad in Iran’s eastern Khorasan Razavi Province. According to Maziar Yazdani, the deputy head of the IRIR, the a $1.5 billion Chinese loan will see electrification of Tehran-Mashhad railroad taking around four years to complete. This inter-city route is double-tracked, so both tracks will be electrified as part of this latest transport management deal. Upgrading and electrification of Iran’s railway network will see increased rail freight speeds on the Tehran- Mashhad line, from 160 kph now, to 200 kph in future, significantly reducing transportation times for Iranian companies needing more efficient logistics services. It is hoped that all Iran’s rail lines will be electric by 2025. This railway route forms part of the International North-South Transport Corridor, aimed at connecting Northern Europe with Southeast Asia, via the railroads of Iran, Azerbaijan and Russia. The railway transport corridor is planned to facilitate a staggering 5 million tons of cargo every year initially, but over 10 million tons of rail cargo in the future. Meanwhile European links are also set to receive a boost from rail Cargo Group plans to operate a trial Germany – Iran rail freight service this autumn, with a view to launching a weekly service in 2018. Developed markets and efficient trade demands modern transport infrastructure and with increased co-operation with foreign trade partners, Iran will see a significant boost in GDP and jobs, as companies jump on board the new freight routes coming online.